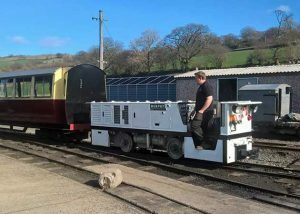 The advent of spring at the railway coincided with a wonderful arrival in March, namely another five-figure donation for the Red Dragon Project from a donor who wishes to remain anonymous. 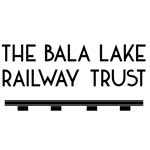 To say that all involved in the Bala Extension, as well as the BLR, are over the moon and extremely grateful for this remarkable piece of generosity is something of an understatement. This is not the first time this donor has made a substantial contribution to the Trust and it was revealing that when this writer met him at a dinner in the Midlands recently, he divulged that one of the reasons he has been keeping more than a watchful eye on extension developments is the manner in which the whole project is being managed and progressed. He was particularly impressed by the way that press announcements contain news of developments that have happened, rather than what is hoped to happen. These comments spoke volumes about our team involved in the protracted negotiations and whatever on a daily basis as well as the whole atmosphere of the railway. Locomotive news this month revolves around two topics. Firstly, all our currently operational steam locos have passed their annual boiler tests, including that of Alice which, as we reported last month, is running up to her 10-year inspection next winter, when she will receive a brand new boiler, with the old one being sold. Our newly arrived diesel, Murphy, has been receiving attention in preparation for entering service but firstly, and more importantly, the management and staff would like to express sincere thanks to all who so rapidly donated to the transport costs appeal to get Murphy brought up to Llanuwchllyn. Volunteers and well-wishers dug deep and very quickly too, so much so that the amount needed was not only reached on schedule but also exceeded slightly. Huge thanks to all. As we mentioned last month, Murphy was built to a gauge of exactly two-feet/610mm whereas the BLR is 600mm, thus re-gauging was essential. Normal practice for a steam locomotive would be to heat the ‘tyres’ and move them on the wheels to the required measurement, although in the case of Winifred, it was decided that heating and shifting might promote cracks in very old metal, hence a new set of axles was built with total success. 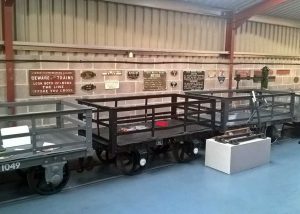 Our engineering team of Rob Houghton and Dan Laidlaw noticed very quickly that Murphy was built to accept adjustments from two feet to two feet six inches as the wheels were fitted with disc collars to allow for changes if necessary. But the collars do not allow for lessening the gauge to the critical and absolutely necessary 600mm. Most teams would have indulged in a marathon of head-scratching but Rob and Dan quietly applied themselves to this fiendish problem of how to overcome this and quickly noticed that the wheels could be removed easily, after which they were put on a lathe and the crucial 5mm each side removed. Call it brilliance, ingenuity or whatever but it worked. 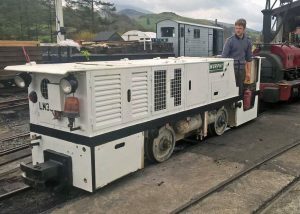 The wheels were re-fitted, the loco was moved back on to the track and promptly tested down to the bottom of Dolfawr Bank with complete success. Since then, Murphy has shunted carriage stock and is powerful enough not to notice what might have been attached! The only problem, apart from the very low roof to the cab (a promoter of bad language thus to be removed) is that she is much narrower than our other locos, hence backing carriages needs an extra pair of eyes. 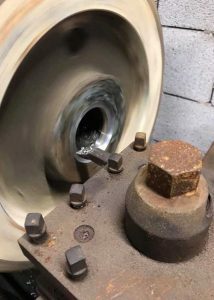 It is to be decided how this minor issue will be resolved, as well as the very low driving position, but you can bet that once Rob and Dan get busy, the solution will be inspired. Prior to the season proper starting on the 2nd April, the engineering team has gone over every carriage from top to tail to ensure that everything is ready. While the first two weeks may not be strenuous, Easter will be a popular time and visitors will benefit from the large amount of foliage clearing and view enhancement carried out over the winter. The last Working Weekend took place around the weekend of the 16th/17th March. Volunteer turnout was predictably good in spite of the weather forecast, the weekend falling obligingly between two notable storms to the extent that the phrase ‘soaked through’ was particularly relevant but did nothing to dispel the humour and good spirits of all involved. Enormous thanks are due to all who braved the ‘liquid sunshine’ of monumental proportions. Indeed, such was the effects of the storms that buildings next to the eastern end of the lake flooded, some to a height of six feet above normal. The first task was to deal with a noticeable ‘bump’ that had appeared in the track on the approach to Llangower and this meant digging up the concrete footpath. The crossing was excavated, the undulation was corrected and several sleepers were changed in the immediate vicinity. On top of this, several sleepers were changed east of Llangower near the overbridge and the cutting near the bridge at least offered a welcomed partial respite from the weather. On the Sunday, while the last mentioned sleepers were being finished, part of the team dealt with neat piles of logs that had been stacked after tree-chopping earlier in the winter, with the chipper making light work of the job. Hopefully, passengers will enjoy the improved views and panorama made possible by the cutting back of the trees. The Wednesday Gang, a few days after the weekend, re-laid the concrete around the footpath and with what was left over, they laid a concrete floor in the new signal lever cabin. The BLR Interpretation Centre, our collection of stock and artefacts showing the fascinating history of the slate industry, has been receiving a major facelift in the form of a beautifully painted floor, the task being completed by Dan Laidlaw and a team of willing volunteers. All is ready now for the Official Opening on the 15th April, with a speech of welcome and dedication at 11.00 starting the celebrations. Other dates to note are the traditional Easter Egg Hunt over Easter from Good Friday to Easter Monday. Take a look at our Special Events page for further details. Saturday 6th April sees the yearly running of our ‘Race the Train’ where sailors and sail-boarders depart from near Pentrepiod Halt just after 17.00 (the train starts from Llanuwchllyn at 17.00) and race the train, invariably full of very noisy supporters, to the sailing club at the eastern end of the lake. This is not as one-sided as it might sound as the club is quite a distance from the current Bala terminus, thus one of the crew has to run perhaps uncharacteristically fast. Last year, there was a near dead-heat, so expect the same degree of fun and enthusiasm. Further details are available by clicking here. 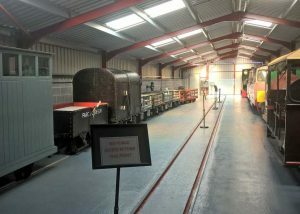 And finally…….. a last reminder about Volunteers Day on Sunday, 28th April, a perfect opportunity to experience all aspects of the railway and in a small intimate group so that Russell Prince and his team can explain more concisely what is involved and how much fun can be experienced. Likewise, the Volunteer section of this website shows testimonials from attendees which give a genuine flavour of what takes place. Recent successes include a husband-and-wife team from the Midlands who are now regular volunteers, the husband taking to firing like the proverbial duck analogy and his wife likewise grasping very quickly the duties of a guard. There are still some spaces left on the day so if the idea of volunteering appeals or you are just curious to see what the fuss is all about, please click here to find out more and register. If nothing else, it will be a memorable day and in wonderful surroundings .